After 20 Years, Can Cornell Finally Bust Open Its Great Pumpkin Mystery? 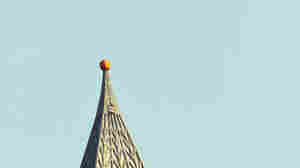 October 31, 2017  In 1997, someone speared a pumpkin on the top of a 173-foot tower. It stuck around for months, an object of fascination and speculation. And no one knows who did it ... unless you know. Wait, do you?